Growing up we had eggs on our table constantly, from big English fry ups on the weekends to cold salad plates my Mum almost always included eggs. One would think that I’d be a STAR at boiling and peeling my own hard boiled eggs but I must admit that I’ve failed in this area for most of my life. Way back when I was a hip 20-something gal I found myself craving an egg salad sandwich. I pulled out my one pot, added in the water and salt and let it boil on high for about 10 minutes. What resulted was not a lovely boiled-egg as I had hoped, I ended up phoning my Father whose laughter could be heard for miles. As a married woman I was determined to master this and thankfully my husband’s grandma gifted me a little appliance which made it simple. It was shaped like a chicken and clucked when the eggs were done! It was adorable and produced perfectly cooked eggs every time! For a long time I had the pleasure of serving up these eggs, peeling was simple….until it kicked the bucket and I realized it was time for me to grow up and make my very own boiled eggs. I Googled the steps and was convinced I had the knack, until batch after batch came out with super tight membranes which made them un-peelable. 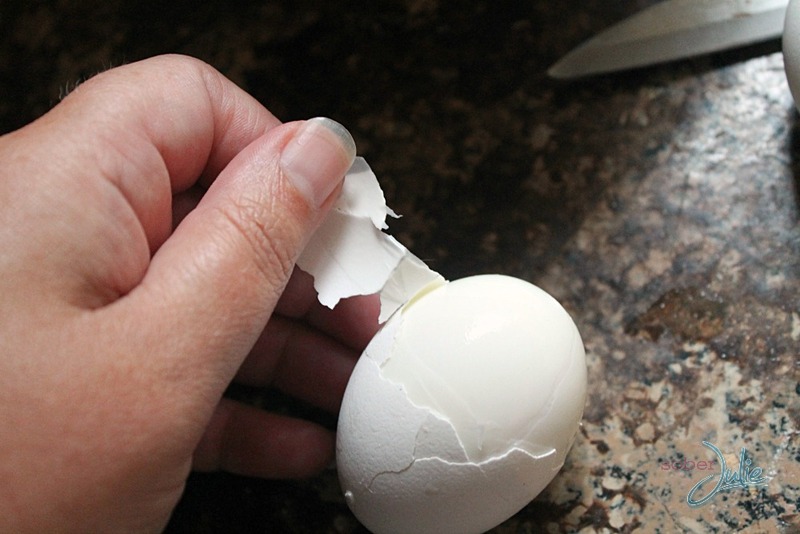 What the heck is the key to making the perfect easy-to-peel boiled egg? Exasperated I did what I know best, I asked someone in the know. Turing to my cousin who happens to be a chef (and a Brit who loves to mock me) I bared my soul, knowing that he would laugh at my inability to master a basic kitchen skill. In typical style he did take the Mickey out of me for a bit but then gave me the key….the SECRET!! It’s very simple really, place your eggs into your pot and fill with water until it’s approximately 2 inches above the eggs. Add in 1 tablespoon of vinegar for every 6 eggs, do NOT add salt as this seals up natural cracks and makes the membrane under the shell difficult to peel. Now place the pot on the stove and turn the burner onto high. Once the water boils you’ll need to start a timer, for white eggs it’s 7 minutes and for brown eggs it’s 9 minutes. Once they’ve reached the required time remove the pot from the burner, drain the hot water and put the eggs under cold tap water. Cooking eggs can be very easy or a pain in the bullocks. The most important thing is to use fresh eggs. The older they are the longer they will need to cook thus leading to over cooked, grey yolks that will make any dish you are using the eggs for taste almost as bad as Bunt popcorn. I wouldn’t recognize you if you skipped the opportunity to pull my leg! Thanks for the tips Mark…once again what would I do without you? Actually, tdhe right way is to use older eggs, which have started to shrink froom the shell. They advise you to buy Easter eggs a week or ten days before you intend to cook them for this reason. I never knew you used different cooking times for white and brown eggs! Thanks for the great tips. It doesn’t matter with color of shell. I agree. Fresh eggs are very hard to peel. I usually keep them refrigerated for 5 days or so, then add vinegar to the water. Let the water come to a full boil, turn off the heat, and let sit for 20 minutes. Run under cold water. Once they have cooled they peel easily. 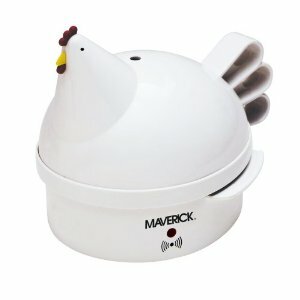 I still don’t know why the chicken egg cooker you have would’ve made perfect peeling eggs? It was just water you put in there, right? That’s the way I do boiled eggs. Don’t overcook – then plunge them into ice water and if you really want to get obsessive about it drop them back into the hot water before peeling. I remember that the ice water shrinks the membrane, I just don’t remember why the last hot water bath. I agree really fresh eggs membranes won’t shrink! Thanks! I have no problem though. I use a spoon and simply pry the egg out of it’s shell while it’s still hot. No cold water. Also, I have to allow large to extra large eggs to sit in a pan for 12 minutes after reaching a boil to fuller hard boil them, yet not allow the sulphur smell. Thanks and God Bless you! I’ve heard this before and tried it. The eggs tasted like vinegar. Nasty. Made me gag and had to throw all the eggs away. oh no! Mine don’t taste like vinegar at all, wonder why? Learned from my Grandma 65years ago how to boil eggs. The vinegar is a must! best to use eggs week or so old. Bring to a boil. Take off burner and let set 15min. covered. Run cold water over for several minutes, peel. Taught my grandson so it can be passed on. Patti, You are right on. Older eggs peel much easier. After boiling for 8 minutes, plunge them in ice water. After they have cooled, the shell will slide right off. I also have been told to VERY SLIGHTLY crack the egg before boiling. I got this tip from an old Amish lady. 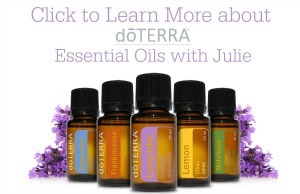 I haven’t tried it yet, but she swears it works. If you’re using them for salads it wouldn’t matter if a little leaked out of the crack, but it might effect the looks of the egg for something like deviled eggs. After boiling, set in cold water a few minutes, wipe off and the put i. The freezer for 5-7 minutes, peelers easily then…no vinegar needed…..
It’s Alice not Akice Sorry! Hi there. I love soft boiled eggs. Do you think it would work the same if you boiled less time? Melissa when I make soft boiled eggs I boil for 5 min then put under cold water so I can hold the egg, then I crack with a spoon and use the spoon to pull the egg out. It slides right out. I agree, older eggs peel much easier than fresh. I have never tried the vinegar trick but will. I usually put my eggs into just enough cold water to cover, add 1 tsp salt, bring to a boil and turn off. Let them sit for eggs-actly 13 minutes, then run under cold water. Not only do they peel easily, there is no ugly green ring around the yolk using this method. Yes, I agree. You don’t boil the eggs. You bring eggs to boiling with just covering eggs with water. Once they come to boiling, remove from heat and cover saucepan. Let sit for 15 mins. Then drain and put into cold water to stop cooking process. Let cool and then peel and eat or use in recipe. old egg, put in cold ice water immediately. If all else fails peel under running water. That helps too. 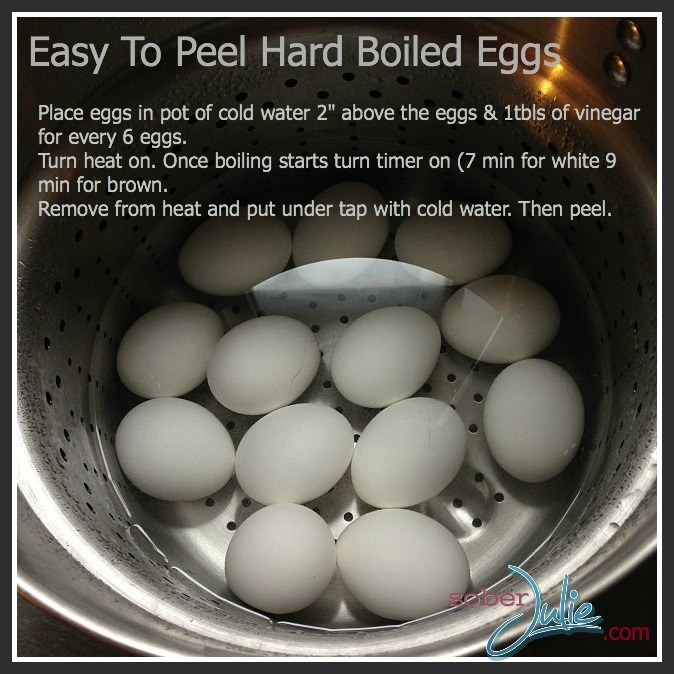 Always use older eggs, they are easier to peel after being boiled. I have never heard about putting vinegar in the water, but I have heard of… and tried shaking some baking soda in the water, that worked for me too. I always prick my eggs with a push pin to keep them from cracking, so I’m not sure vinegar would work for me. I only use the push pin for this purpose and always wash it. I just made these and they are perfect. I had a little of an issue with 1 or 2 of them but I’m not that great at peeling eggs anyway. Thank you for saving me 30 mins of my life. I think some problems arise from “what is boiling water?” Is it when the first bubbles appear or when it comes to a rolling boil to start the 7 minutes time. I really hope your right cause I never have hard boiled eggs peel right. Do you take them off the burner when they boil or boil them for 7 minutes? Do you put a lid on them at all? The water is brought to an “almost” boil, (bubbling simmer) over “moderate” high heat. High heat will toughen the whites & accelerate a chemical reaction between the iron of the yolk & the sulfur of the whites that results in a green ring around the yolk. This will also happen if you over cook them. For perfectly cooked hard boil eggs, cook in simmered boiled water for 10 minutes “Without” a lid. With slotted spoon transfer them into a cold water bath to cool them down & prevent over cooking. Keep refrigerated until ready to peel. The colder they are, the easier to peel. The best eggs for peeling are those that are a week to ten days old because they have developed large air pockets that simplify the peeling process. Water two inches over 6 eggs – check. 1 tbl vinegar – check. 8 minute cook time once boiling (i added a minute because couldn’t believe 7 would be enough) – check. Run under cold water – check. The result? An extremely hard to peel, soft boiled egg. I so wanted this to work! Can you put undercooked eggs back on the stove to cook longer? After the egg is boiled, I just go “knock, knock” and roll the egg under the palm of my hand on the kitchen counter and there you have it. The egg shell is cracked to pieces and the membrane comes off too. Place into cold w as terms and bring to a hard boiled. Remove from heat 20 minutes. Plunge into ice water. Use a small to medium tupperware/plastic container with lid, fill 1/4 full with cold water, place 2-3 egs and shake gently. Eggs will fall out of their shells. Don’t shake too hard or eggs will fall apart. These turned out great! Thanks for the tip, I’ve been looking for a way to easily peel eggs and have them done perfectly for awhile. If you crack the eggs and let them sit a few minutes in the water the shell will peel right of!